It is not surprising that Bax�s choral-orchestral works have had to wait until almost the end of the queue before being recorded for the first time. Bax�s reputation, after all, stands on his instrumental music especially the symphonies and tone poems. Bax was not naturally a Three Choirs cathedral person. Like Bantock his inclinations were pagan and pantheistic. If he set Christian texts they looked back to the early church and to the margins between nature worship, Christianity and mysticism. The major works here, St Patrick�s Breastplate, The Morning Watch and Crashaw�s To the Name Above Every Name are compact. The longest work is the Crashaw setting at just over twenty minutes. In their compression and concentration these pieces bear a closer resemblance to the exotic-ecstatic works of Szymanowski (Stabat Mater, Litany and Song of the Night) than they do to the Three Choirs mainstream represented by Stanford�s Requiem, Howells� Missa Sabrinensis, Finzi�s Intimations of Immortality, Cyril Rootham�s Ode on the Morning of Christ�s Nativity, the Hodie and Dona Nobis Pacem of Vaughan Williams (a rugged agnostic happy using the medium of the cathedral tradition) and that still fine yet unsung work Maurice Jacobson�s Hound of Heaven. Szymanowski was one of Bax�s idols (the initial dedication of the Sixth Symphony was to the Polish composer). Of course Bax did write some rather dull ecclesiastical music but this came in the late 1940s and is completely atypical. The works here, especially St Patrick and To The Name Above Every Name, have a lineage stretching to Mater Ora Filium. This in turn has its own roots in the mulch of Byrd�s masses but with a sensuality very much of the twentieth century. The two Nocturnes are songs with orchestra - not choral works. They are early settings of Dehmel and Hartleben and are best viewed through the spectacles of German late-romanticism. There is a Klimt-like starry gorgeousness about the orchestration that links with Schrecker, Korngold, Zemlinsky and especially with Marx. The demands on soprano Christine Bunning are considerable but she rises to the occasion even if her vibrato tremor is not ideal. Fascinating anyway. The Morning Watch came the year after the Sixth Symphony. It sets Henry Vaughan's poem and was a Three Choirs commission for Worcester. The dedication is to Sir Ivor Atkins �in memory of very old days�. The long orchestral introduction takes up about a quarter of the work's total time. The elements here are Delian and celebratory as in the Coronation March. There is even a momentary anticipation of John Ireland's These Things Shall Be in the trumpets at 3.13 and the march at 5.19. The nostalgic contentment as in the Seventh Symphony is apparent here. Vintage Bax mysticism is apparent in the swirling colours of 6.32 with harp and exalted singing. The velvety return of the theme from the opening at 12.31 is affecting. The complexity of the valedictory �amen� touches on Mater Ora Filium. The stratospheric exposed writing for voices at the very end is creamily delivered by the Huddersfield Singers. While The Morning Watch shows the first signs of the dutiful Bax this is not true of To The Name Above Every Name which was written without a commission. Listen to the gruff grind of the counterpointing brass at the start as the voices enter. Echoes of the Second Symphony and of Mater Ora Filium are threaded through this work. The Symphony is quoted just before the entry of the solo soprano. Altogether an impressive piece. Perhaps the most cogently fervent of the works here is St Patrick's Breastplate which has a resolute trencherman's defiance about it. It is perhaps no accident that the text's subject matter is Irish and its year of completion was the same year that saw the founding of the Irish Free State. The performance of this work at the 1934 Gloucester Three Choirs probably brought about the commission for The Morning Watch. To complete the circle 1923 was also the year in which Bax heard To The Name Above Every Name at the Three Choirs in Worcester. The indomitable march at 5.10 is of the highest conviction - completely natural and unmanufactured. The melismatic treatment of the word �amen� at 9.00 is a vintage Baxian hallmark. The disc is, as usual, handsomely documented with notes by Lewis Foreman and full texts also in German and French translation. 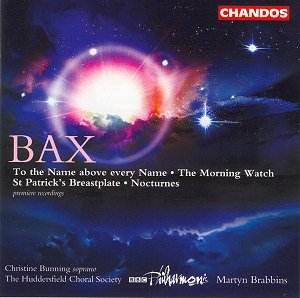 Choral Societies looking to revive a Bax work should hear this disc. In order of originality and patent conviction I would recommend first St Patrick's Breastplate, then To The Name Above Every Name and then The Morning Watch. These works are impressively performed with a fervour that suits them very well indeed. Recommendable of course to the legions of Baxophiles worldwide but beyond that to enthusiasts of the British choral tradition into which Bax sometimes slipped with more ease than you or he might have expected.